Category Archives: Is That Still On? Boy, are we glad we bailed out the auto industry. So they could spend money on helicopters, Greek gods, aliens and ancient civilizations. All in one commercial! Also, what? That’s not cool, right? Also, why does Coca-Cola even bother coming up with ideas to fill 30 seconds. Their worldwide brand awareness is 110%. Just have a single title card that says “Why waste any more money on this commercial? You know who we are and nothing we do here will make you more likely to drink Coke. So for the next 25 seconds here are some puppies.’ Now that’s a commercial! So it happened! 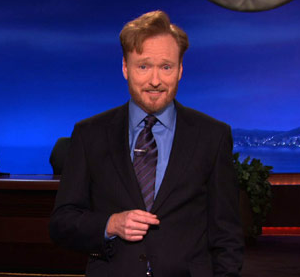 Conan O’Brien finally returned to TV, this time taking his talents to the basic cable shores of TBS. The anticipation was palpable, and at 11pm EST Monday night we turned our TVs to see the redhead comedian’s triumphant, cathartic, possibly historic, debut. And then at midnight, after Conan finished jamming with buddy Jack White, he signed off and George Lopez came on, an hour later than usual, but, with Daylight Saving time having just gone into effect, perhaps completely in line with our circadian rhythms. And, well, the world had not changed. With the Saturday Night Live retrospective In the 2000s: Time and Again airing last Thursday, we thought it would be a great time to revisit our list of the best SNL sketches of the 00s from earlier in the year. If you saw the show, you might recognize some of our selections. And here’s a clip that didn’t make the broadcast, a behind the scenes look at the Sarah Palin rap. I will never, ever, get tired of seeing Jason Sukeikis as Todd Palin. And, for kicks, here’s one of our favorite sketches of the new decade. Been meaning to work this one in for a while, and this seems like a good excuse. For the record my dad loves Burn Notice.